Small animals and robots moving through complex terrain are susceptible to flipping over. For example, in our previous study of terradynamic streamlining, cockroaches and small legged robots can become unstable as their body rolls to traverse cluttered grass-like beam obstacles (Fig. 1). While cockroaches can quickly right itself after flipping over, robots are much less able to do so. Figure 1. Current small legged robots often have trouble righting themselves if flipped over when traversing complex terrain. By contrast, small animals like cockroaches easily right themselves. After millions of years of evolution, animals often have body features and appendages that are multi-functional through adaptation and exaptation. For example, cockroach’s rounded wings are normally closed for protection and its rounded shape facilitate obstacle traversal through terradynamic streamlining. However, when flipped over, cockroaches can promptly open their wings to dynamically self-right (Fig. 2). Figure 2. Cockroach’s wings serve different functions in different locomotor scenarios. Inspired by the amazing locomotor abilities and multi-functionality of small animals like cockroaches, we developed a new mechanism for small legged robots to dynamically self-right from an upside-down orientation by opening wings. We split the rounded shell in half, and added high speed, high torque, miniature servo motors. We designed a novel 2-DoF joint and transmission mechanism such that each wing pitches and rolls away from the body as they open (Fig. 3), in a similar fashion the winged insect. Figure 3. Cockroach-inspired design of winged self-righting mechanism by splitting and adding actuators to the rounded shell (which enabled traversal of cluttered obstacles). Like the cockroach, our self-righting robot can self-right dynamically by opening its wings to push against the ground, using kinetic energy to overcome potential energy barriers. In ongoing research, we are integrating the winged self-righting mechanism with the rounded shell design to enable the robot to traverse cluttered obstacles and self-right when flipped over. This will be a first step towards animal-like multi-functional locomotion in small legged robots. Our robot provided us with a physical model to precisely control and systematically vary locomotor parameters and study the principles of ground-based dynamic self-righting. We discovered that the robot’s self-righting performance increases with both wing opening magnitude and wing opening speed (Fig. 4). Figure 4. Winged self-righting performance increases with both wing opening magnitude and wing opening speed. Arrows indicate increasing performance (higher righting probability and shorter righting time). In our animal study, we observed that when cockroaches self-right, they often open their wings asymmetrically, with one wing opening more than the other (Fig. 5). We speculated that opening wings asymmetrically may provide them with certain advantages over opening wings symmetrically. Our robot provided us with a tool to test this biological hypothesis because we can control the left and right wings separately. Figure 5. Cockroaches often open wings asymmetrically during winged self-righting. 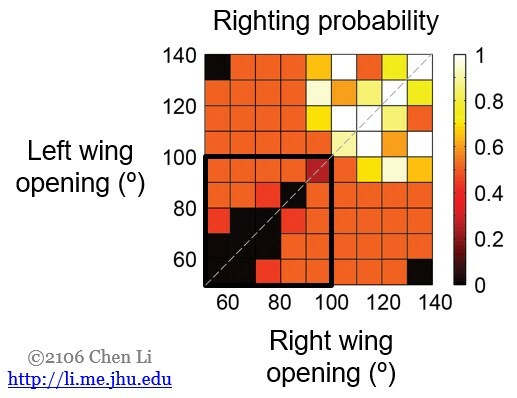 By systematically varying left and right wing opening magnitudes, we discovered that, at low wing opening magnitudes, asymmetric wing opening actually increases the probability of successful self-righting (Fig. 6). This suggests that the asymmetric wing opening can help the animals right when they cannot open their wings large enough (for example, when animals are fatigued). This can also be used for robots for situations of low power or low torque limitations (for example, when batteries are running low or when payloads are large). Figure 6. When wing opening magnitudes are small, opening wings asymmetrically increases righting probability (lower left quadrant). Sometimes, asymmetric wing opening results in under-righting or over-righting. This would require assistance by legs to achieve a fully upright orientation, which is ongoing research in our lab.